Boolog - It's all about the boo.........................Booray's Blog: This is actually an interesting post about comic books. Really. This is actually an interesting post about comic books. Really. Anyway, they have a new thing now in the comic world, it's called CGC. It's an independent company that rates the quality of comic books. You send them a comic, they inspect it, assign it a rating (say, 9.6) and seal it in hard plastic. If you buy a comic that is sealed this way, you are guaranteed to get it in the exact condition that it was rated. Sounds like a good idea. But wait! If you break the seal to, oh... I don't know, read the comic.... it loses it's rating. You have to send it back to CGC and have it inspected and re-sealed. Here's the best part: It costs $16 to have a comic inspected and sealed. So, say you wanted to buy Watchmen #10. In near mint condition, that book will cost you $5. 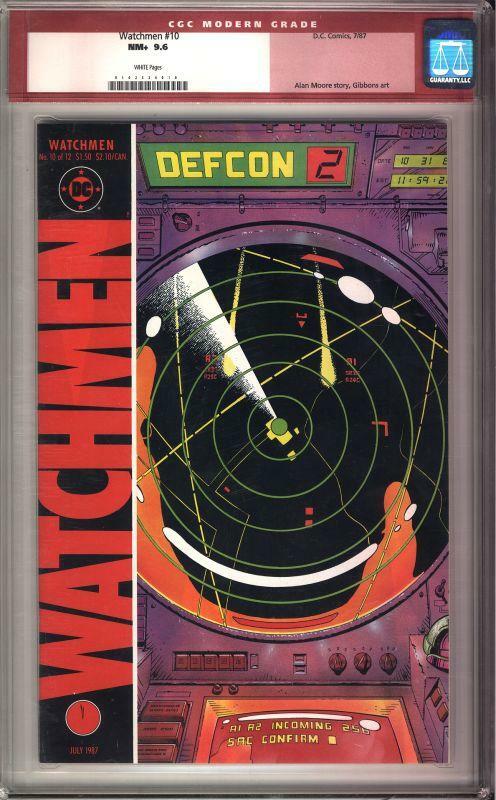 The very same book with a CGC rating will cost you $24... and you can't even read it! Well, you can read it but then you have to send it back for a re-seal ($6) and you run the chance that it will get a lower rating because you friggin' touched it, causing you to lose money on your investment. Here's the thing. If I want to buy Detective Comics #1 (first appearance of Superman, the Holy Grail of comics, value=$350,000), I can see paying an extra $50 because it has been certified and sealed. But why pay $25 for a $5 comic that you can't even read? What does all this mean for comic collectors? It's turned collecting into a commodity trading market. People buy and sell sealed books based soley on value and appreciation without ever reading them. It reminds me of something I read a few years ago about how you can now buy an expensive baseball card and never actually take possession of it. It stays in a secure vault at the manufacturer. If you sell it, all that changes is the name on the receipt. Where's the fun in that? Personally, I'll stick to buying comics I can actually enjoy.